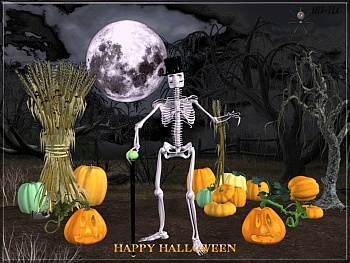 An animated screensaver with dancing moon, pumpkins, and an elegant Skeleton. The 3D fantasy image, including spider and tombstone animation. "Dance the Night Away" music is optional. Happy magic spell casting Halloween! Download Moon Dance Wallpaper, and an "animated wallpaper", too! Images and Screensaver copyright, ART-TLC ©.